Description: NS D9-40CW 9523 and a SD70M unit move through the yard. 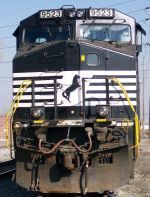 Description: Black and white locos now run this former Conrail main. This line saw black and white units pre-1976, a little deja vu but with diffrent logos and road name. Now if they could just twist the stripes into a "P" interlocked with a "C" it would be complete. Description: NS 9945, still wearing its primer paint, leads a train east through Leetsdale. Description: The only UP train of the day heads under the Hwy A overpass east of Rutledge. Description: NS 12R westbound at Front Royal Junction. 12R was chasing down NS 214 that is about 30 minutes ahead on the H-Line. Description: H18 heading through Roherstown on its way to Dillerville. Description: The NS 9523 is the second unit on L42. Description: 20G has an approach signal as it passes Macungie at 5:27PM. Description: Eastbound on track one where he will head on to the Layoff Track. Notice the two different numberboards on the 6728. Description: 18th Ave., 0802 hours. Description: NS train 281 heads south on the GS&F district between Sycamore and Chula, GA. Description: 21M passes an MOW gang working on Track 2 just west of CP-Wyomissing Jct.